Meross AC1200 Wireless USB Adapter MWA265 is designed to take your PCs and Macbooks to online world with the next generation Wi-Fi Standard - 802.11ac technology. With wireless speed of up to 1200Mbps (866Mbps at 5GHz and 300Mbps at 2.4GHz) and super speed USB 3.0 port, MWA265 provides you with a fast, reliable wireless connection for lag-free HD video streaming and online gaming. Moreover, MWA265 supports both 2.4G and 5G bands, you can flexibly choose the less congested band for connection. 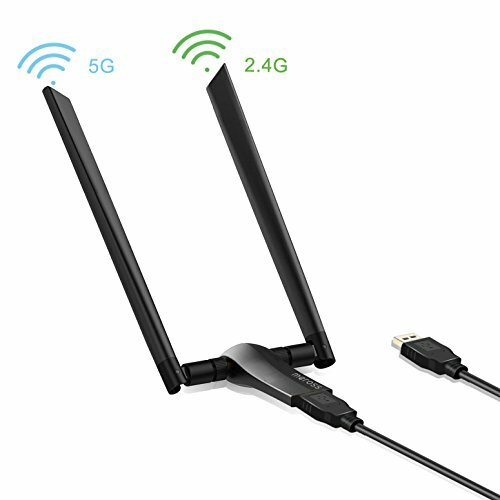 Apart from the general features, MWA265 can achieve wider wireless coverage and stable connection with its two high gain external antenna. Universal Design: Innovative mini design & Works with windows 10, windows 7, windows 8.1, windows 8, windows vista, windows xp of 32bit or 64bit, etc. If you have any questions about this product by meross, contact us by completing and submitting the form below. If you are looking for a specif part number, please include it with your message.